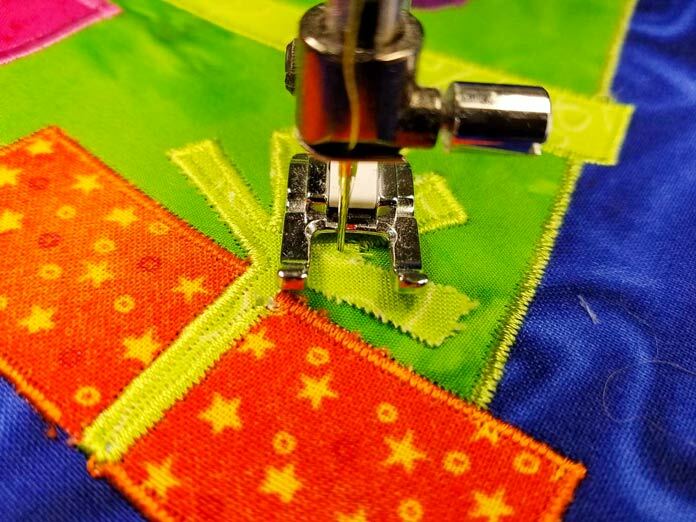 7 tips for successful applique every time! Home » Husqvarna Viking » Husqvarna Viking Epic 980Q » 7 tips for successful applique every time! Isn’t this exciting? 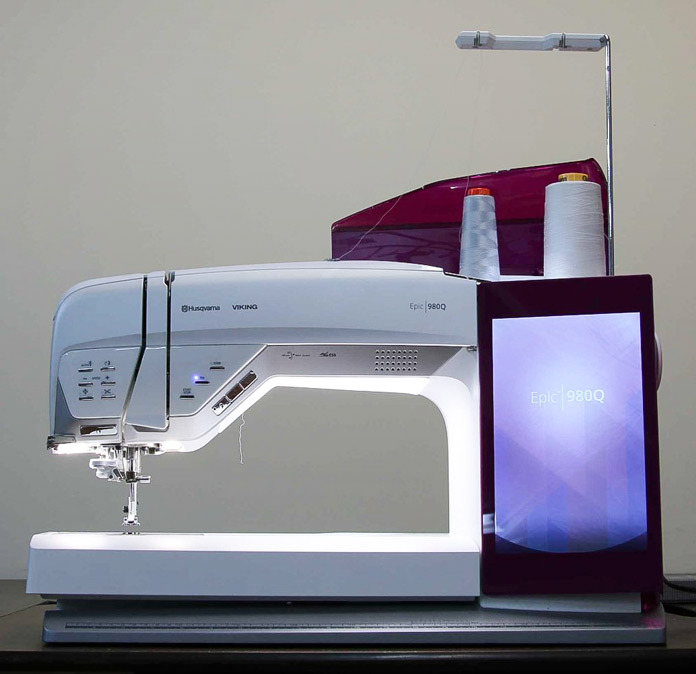 The Husqvarna Viking Epic 980Q is a super sewing machine. Loads of features that make quilting a dream. 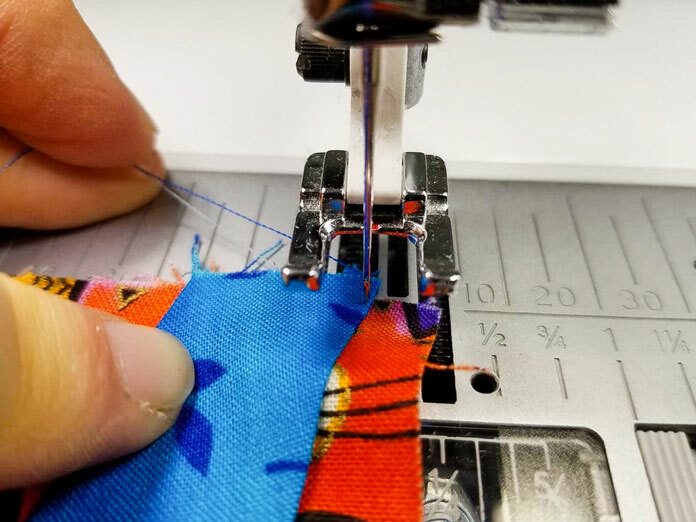 Of course, it would be a snap to sew garments or bags or other items on the Epic 980Q, but the focus this week is on techniques and features that are beneficial to quilting. 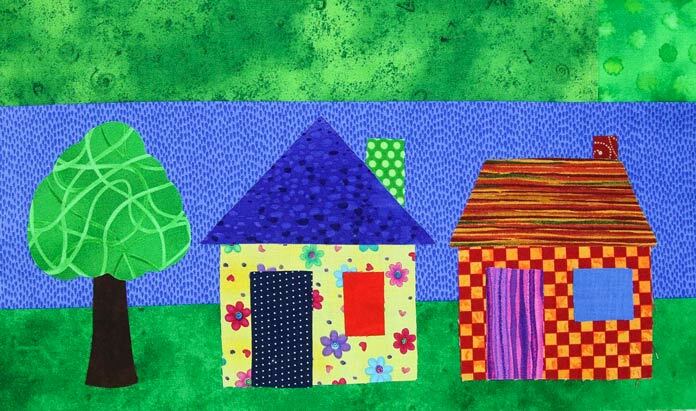 The 6 tips for successful piecing I outlined yesterday are very important as piecing creates the foundation for your quilt. I’m moving along to applique today using the Epic 980Q. 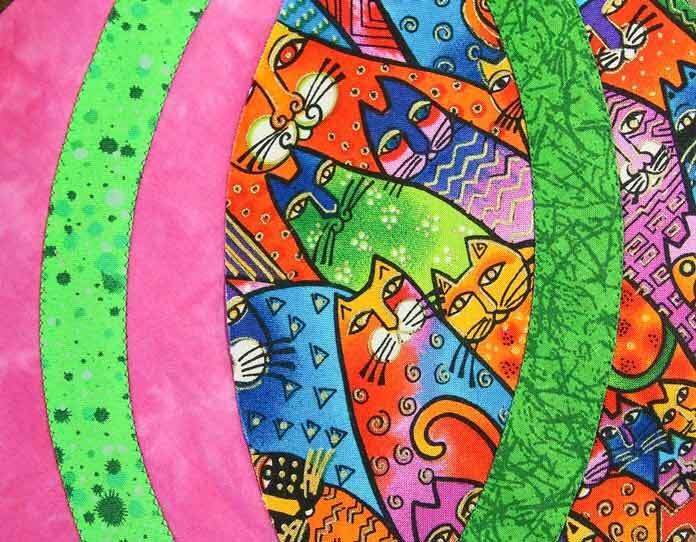 I’m going to show you some great tips to make your applique beautiful. Let’s get started. I can’t stress this enough. 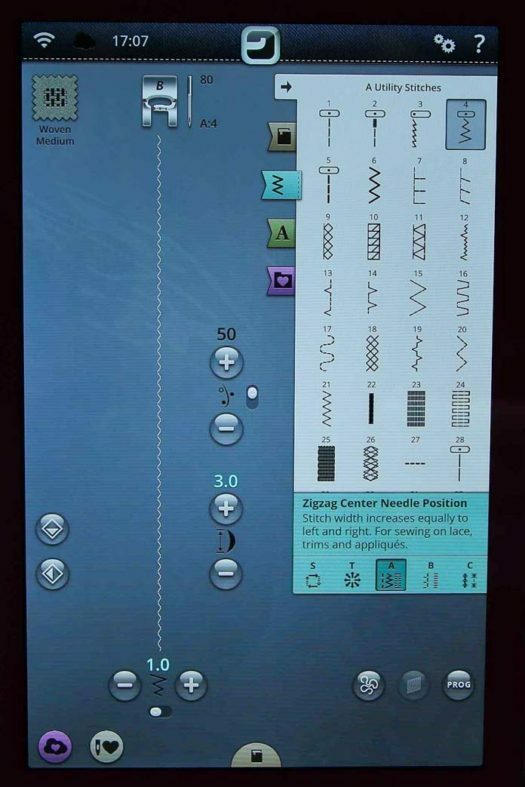 Even though the stitch will appear in real size on the interactive touchscreen, you need to try the stitch out before you attempt to stitch it on your work. No one likes to rip out. I keep a small piece of fabric (with stabilizer – more on that in a moment) and whenever I’m about to choose a new stitch, I make a small stitch out so I can see in real life the width and length of the stitch. This gives me a better opportunity to know if the stitch specifications will produce the look I want. I would also mark the stitch width and length on the stitch out so when you have tried several different stitches, you’ll know which one you want and how to recreate that stitch. Menu B on the Epic 980Q is full of a variety of applique stitches. 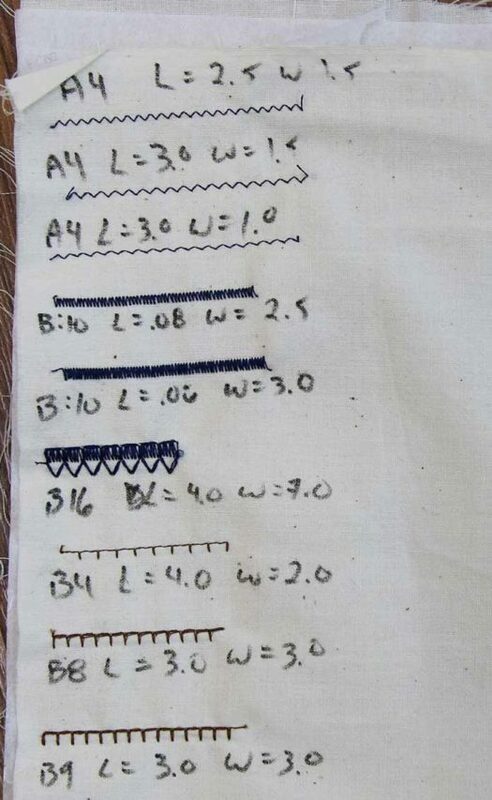 One of my favorite applique stitches is the zigzag which is also located in the Menu A – Utility stitch menu. Every one of the stitches on any of the menus is fully adjustable. That means I can play with the width and the length and I can get some very creative stitches by doing that. It also allows me a lot of flexibility. In the event that you don’t like what you’ve done, it’s easy to remove satin stitching by slitting the back of the stitches with a seam ripper. Then from the front of your work, pull the top thread and it should come away very quickly. You don’t need a stabilizer for all types of applique, but you definitely need it for satin stitching. Don’t even think of satin stitching without using it as you’ll end up with all kinds of ripples on your work and that isn’t going to be pretty. 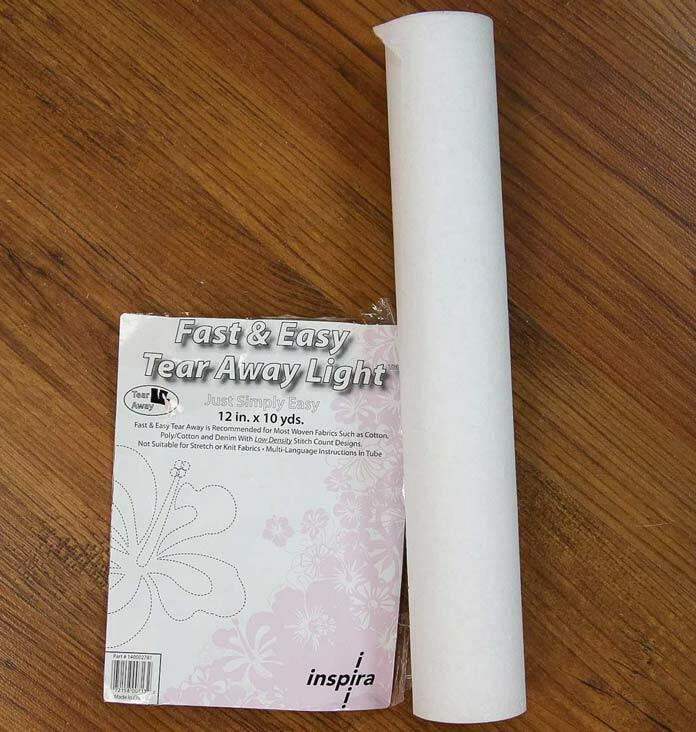 For satin stitching, one of my favorites is INSPIRA Tear-A-Way Light. 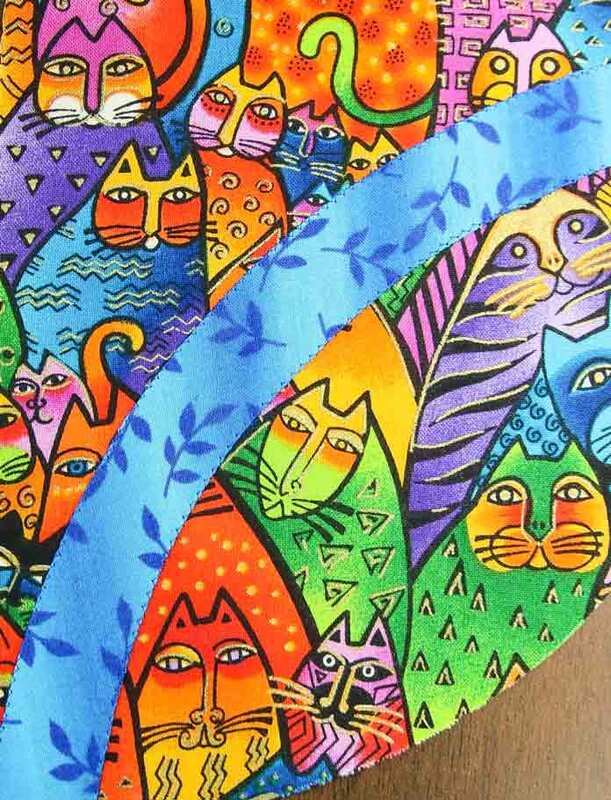 This is good when you’re doing fusible applique. You need a little bit of stability, but not a lot. This product works like a charm. The nice thing about using stabilizer with a satin stitch is that it tears away cleanly. I’ve removed all the outer parts of the stabilizer in the photo below. You need to remove the stabilizer from the inside of the shapes as well. Again, this is very easy to do and if you have tiny spaces that the stabilizer gets caught in, I use the end of my quilter’s awl to poke the bits out. It’s not critical if some little bits get left in the project. I was on a roll and next thing I knew, I was doing some buttonhole stitching and I had stabilizer underneath without even thinking. 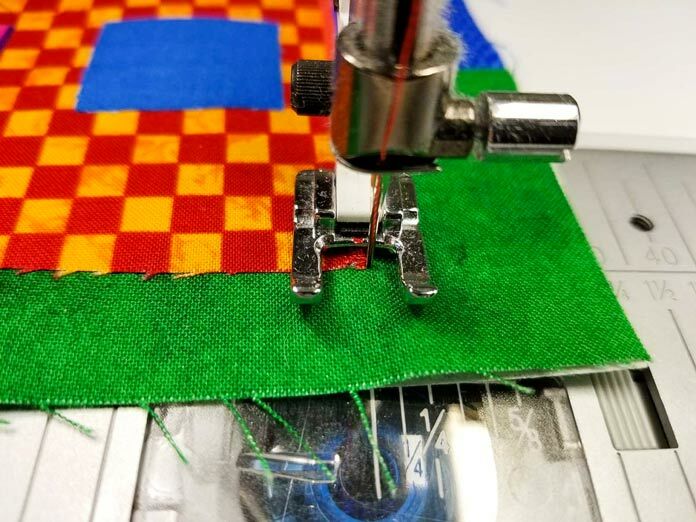 There isn’t anything wrong with using stabilizer for buttonhole (or blanket) stitch, but it probably wasn’t necessary in this case because I was using it on some fusible applique shapes. 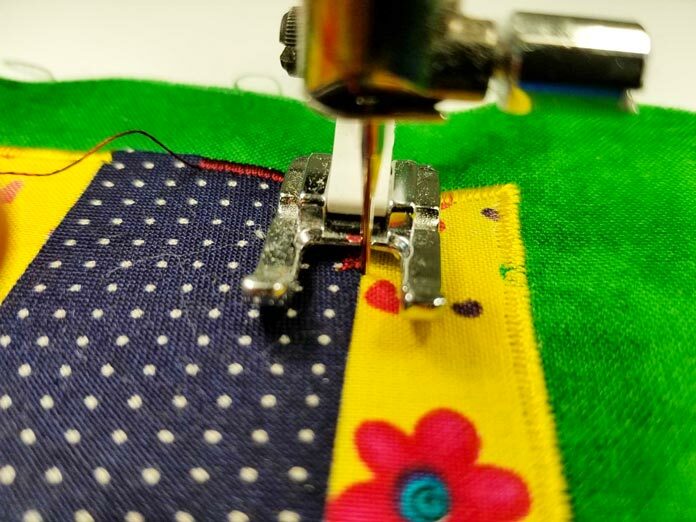 In the photo below, you can see that it doesn’t tear away on the buttonhole stitch as cleanly as with the satin stitch. Like I said, it’s not critical that all bits get removed. You want to make sure the bigger pieces are gone, but this is perfectly fine. This is another very important tip. Whether you use the Scissors feature on the Epic 980Q or whether you don’t, make sure that you keep the threads trimmed on the top and the bottom of your work. I trim after I end every line of stitching. Otherwise, it’s a huge mess on the back and those threads get all tangled and if you leave the threads on top, you’ll likely stitch over one of them which makes them harder to remove at the end. It’s just good housekeeping – keep the threads trimmed! In this picture, I’m holding the ends of the top and bobbin thread as I’m about to start stitching at the end of a row. 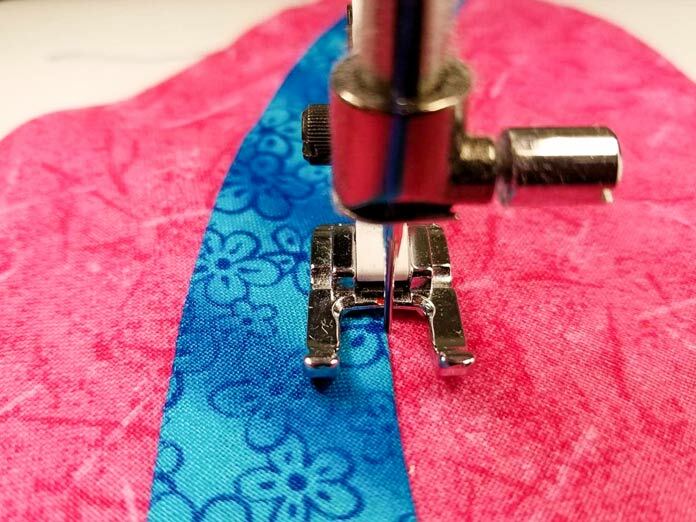 If you’re starting in the middle of a piece and you didn’t use the scissors, simply bring the bobbin thread to the top of the work and hold both so they don’t make a thread nest on the underside of the work. If you’ve used the scissors, then the top thread should have been taken into the bobbin case and you don’t need to hold it. In addition to using good quality thread, make sure you use the appropriate thread for the type of applique that you’re attempting. 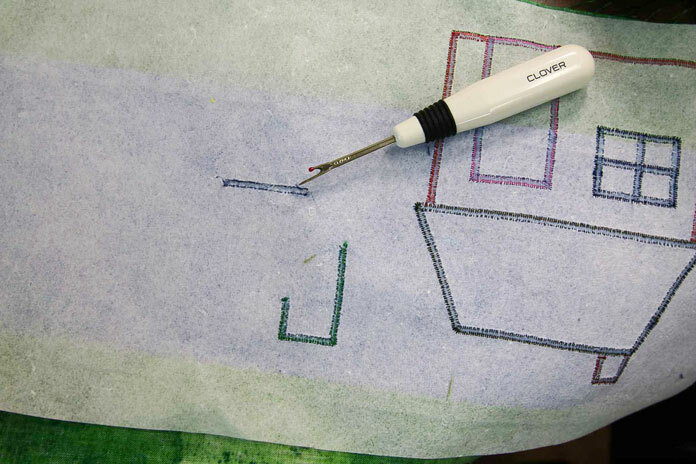 For invisible applique, I love to use Wonderfil’s Deco-Bob. It’s very fine, comes in a wide variety of colors and it’s very easy to use. I use it on the top and in the bobbin. I’ve never had issues with it. Alternatively, you could use invisible thread on the top. I prefer to not use invisible thread on the top and in the bobbin at the same time, but there’s nothing wrong with doing that if it works. Just remember that if you use invisible thread in the bobbin, use the speed control on the bobbin winder and wind the bobbin at about half speed. I love the thread path on the Epic 980Q. I’ve never had an issue with this thread path system. It’s truly the best and that top part of the thread holder pushes down in the machine when you want to put the machine away. What thread color is best? That’s totally dependent on the look that you want and how much of an investment you want to make in an inventory of thread. In the two examples below, the two green curved shapes are appliqued to the background. I used the same color thread on both. You can see that the thread is more noticeable on the lighter green and practically invisible on the darker green. If you’re working with a limited budget, I would suggest that you get a light, a dark, and a couple of medium taupe colors and you should be good to go for any project. If you’re going to applique something white or black, you may want to invest in those two colors as well. It’s very important to choose the appropriate stitch for the type of applique that you want to do. If you want your applique to be invisible or as near to invisible as you can get, it’s important to choose a small obtrusive stitch. My preference is the zigzag stitch. You can see the stitches in the photo below which is larger than real life. On a quilt, this would totally disappear and be invisible. What settings of zigzag do I use? This is where the stitch out comes into play. Experiment with the various widths and lengths until you find something that you like and that you can stitch properly. If the zigzag is too narrow, and you’re constantly missing the edge of the applique, then you have no choice, but to use a wider zigzag. If your stitch length is too short, the stitches become too obvious because there are more of them. If your stitch length is too long, the piece won’t stay in place properly and you have spaces between the stitches. Once you have a stitch setting that you like, make yourself a little book with this information in it. That way, you won’t have to go through the stitch out process again. My preference as shown below was a length of 3.0 and a width of 1.0. In order to properly stitch down the applique, you want to keep 99% of the applique stitch on the applique shape. That means as your needle swings to the right, it should just skim past the edge of the shape and go into the background fabric. This ensures that the entire edge is encased in the applique stitch and no little ridge will appear along the edge. This is where using your Needle Stop Up/Down is absolutely a must. 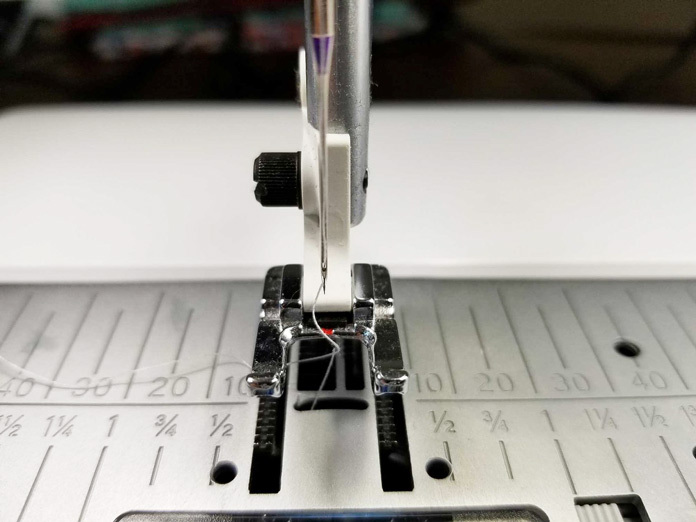 When you need to stop or pivot, the needle stays in the work, the presser foot raises automatically and you can pivot or whatever you need to do. Absolute essentials for good applique. 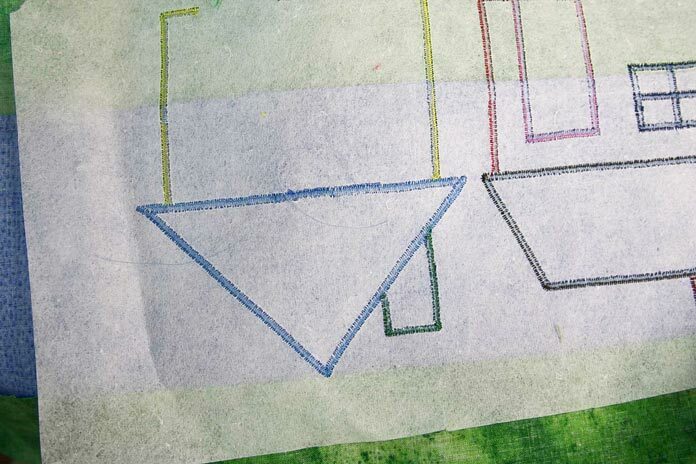 Learning how to pivot properly is essential to making any applique project shine. The Needle Stop Up/Down function is critical to its success. Once I have this feature engaged, I can stop anywhere I need to, the needle stays in the work to anchor it, the presser foot raises ever so slightly and I can pivot a little or a lot. When you pivot on a square corner (as shown below), stop with the needle at the outermost point. Then you can pivot. It’s common for people to pivot a full 90˚ at this point, but because I have access to the Needle Stop Up/Down feature, I pivot slightly, take one stitch, then pivot slightly, take one more stitch and so on, until I’m completely around that corner. So instead of taking one stitch to pivot, I might take 5 or 6. If you don’t use a presser foot that raises automatically, you will NOT pivot 5 or 6 times. But doing that makes a nicer corner. I think! I wanted to mention something else about the photo above. Notice the rough edge of my applique shape? (the red/orange). This is NOT good. This has been sitting around for a while and some of the edges have frayed. If this happens, I try to tuck them close to the edge of the applique shape as I’m stitching so they’ll be enclosed in the satin stitch. The lesson here is to not wait so long from prepping the pieces and stitching them, or make better shapes! To help you get to the right spot in order to pivot, there is no need to touch that flywheel. Simply tap once on the foot pedal (WOW!) and the Epic 980Q will advance half a stitch. Keep tapping until you get the needle in the exact position that you need in order to pivot. 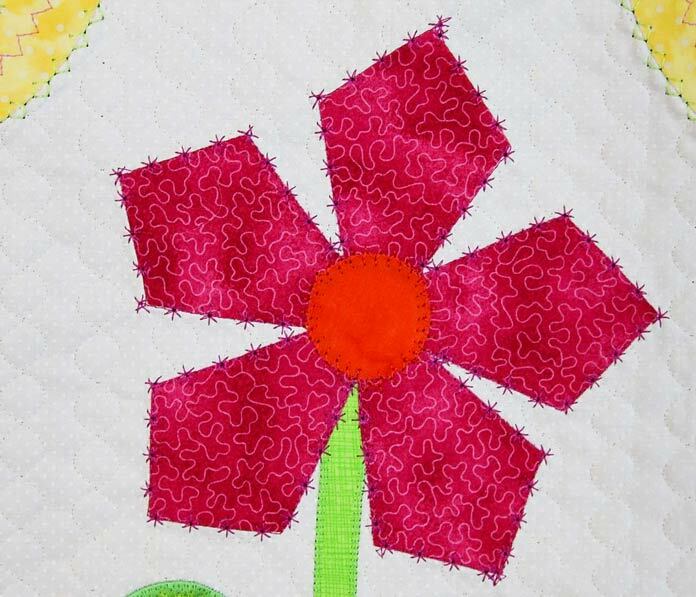 If you’re going to pivot on an inside corner, then you need to pivot on the applique shape, NOT the background. See the example below. I did the same process by making 5 or 6 small pivots to get around that inner point. I know – this applique piece has been sitting around forever and look how bad the edges are! In the photo below, you can see some examples of the multi-pivot corners. Also, notice the point on the blue roof. This was done the same way – lots of pivots. But if you have a sharp point like this, you may also want to decrease the stitch length as you get closer to the point. Once you turn the corner, then you can increase your stitch length to what you were using. Don’t forget what that width was – it’s easy to forget! The stitch width is very easy to change on the Epic 980Q. It’s right there on the interactive touch screen. Here’s an example of the inside corners. 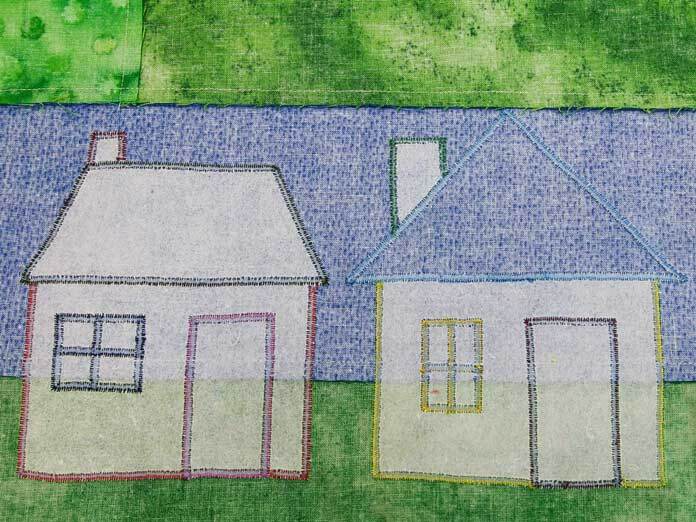 There’s always the age-old question – should I stitch the edges of the fusible applique? Well, it depends on several things. Will the quilt be used as a wall hanging or will it be washed? How fussy are the edges? If you have a tree or other outlines with a lot of jagged edges, it might be better to let it go. Just make sure those edges are cut well and fused well. But when you’re working with something cute and whimsical like this block – the satin stitching adds to the look. Check out the photos below to see the difference. Another question – can you combine different stitches into the same block? Why not? I used satin stitching for the two houses and then buttonhole stitch for the tree. Notice that some of my threads are contrasting and some of them are matching. It’s totally up to you and totally depends on your thread inventory. 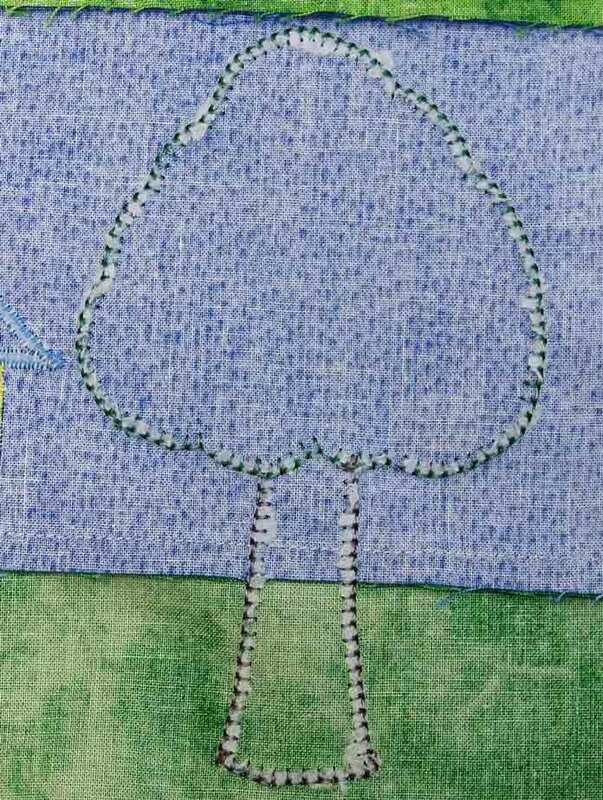 I should mention that when I used the buttonhole around the tree, it was absolutely critical that I use the Needle Stop Up/Down function. This is a double stitched buttonhole stitch and you had to be on your toes to pivot when the stitch was completely finished. Not a good one to do while visiting with friends but the end result is so cute and gives a nicer finish to the tree. Bonus TIP – make sure that you stitch the pieces in the proper order. Start with the bottom-most pieces and work your way up. 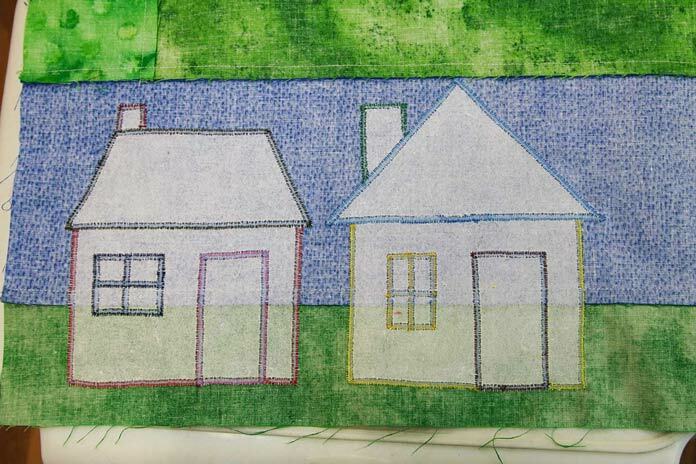 In other words, I stitched the chimneys before I stitched the roofs of the houses. As a result, the ends of the stitching on the chimney aren’t really anchored by anything else. One other function that I used on the Epic 980Q to make my applique much easier to do was the FIX function. This came in really handy to secure the ends of those lines of the stitching. The BRIGHT light and the extra room on the bed of the sewing machine made it so easy to see the work. And the automatic needle threader? I used it all the time as there were a LOT of thread color changes and using that automatic needle thread made changing threads a snap. I’m not usually good with needle threaders, but this one and I got along just fine. I looked up how to use it in the Knowledge Center that’s built in the Epic 980Q. I found a few new (to me) stitches in the applique menu, one of which I stitched out in my stitch outs above. But don’t forget that you could basically use any stitch for applique. Depends on the look. 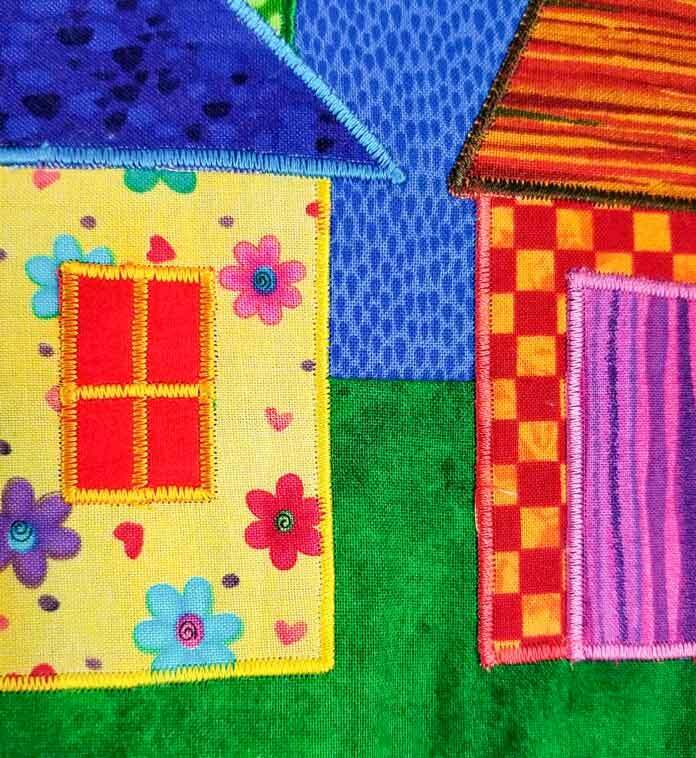 Here’s a sample of using a decorative stitch as an applique stitch. Yes, it’s a wee bit tricky, but the end result is so beautiful. You really must be on your toes to know when to pivot. But once you get the hang of the stitch sequence, it’s not bad at all. Before you start a new line of stitching, touch the Stitch Re-Start function on the Function Panel to get the EPIC 980Q back to the beginning of the stitch sequence and still retain all your settings if you’ve changed anything. 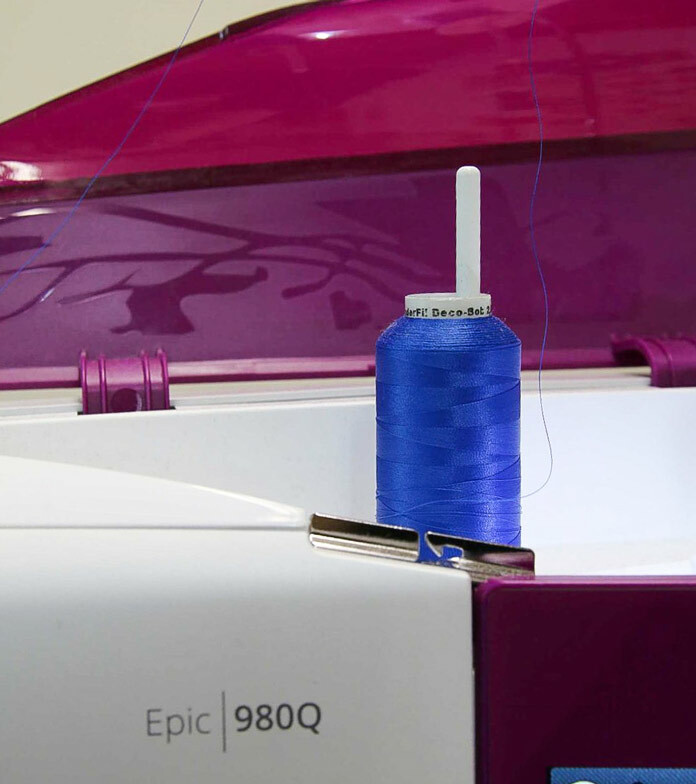 Here’s one other feature on the Epic 980Q that can be very helpful for your applique. 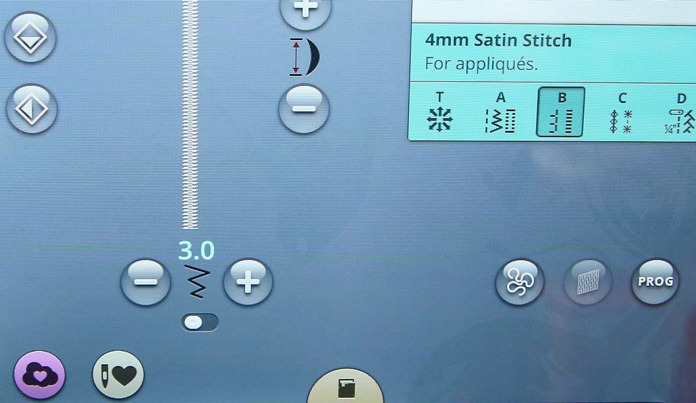 Some of the buttons on the touchscreen play dual duty. In the screenshot below, you can see a small slider button beneath the stitch width. Moving the slider button to the right reveals a second function for those PLUS/MINUS keys. We now have the ability to move the stitch to the left or the right. How far to the right and to the left you can move the stitch depends on the width of the stitch that you’re using. Depending on my project, it may make sense to move the stitch rather than the project. Or if you want to use the red mark on the open toe applique foot as a guide for the edge of your applique, this is a perfect solution. When you’re using an applique stitch, the red mark will be in the center of the stitch and doesn’t really help you with aligning your work. 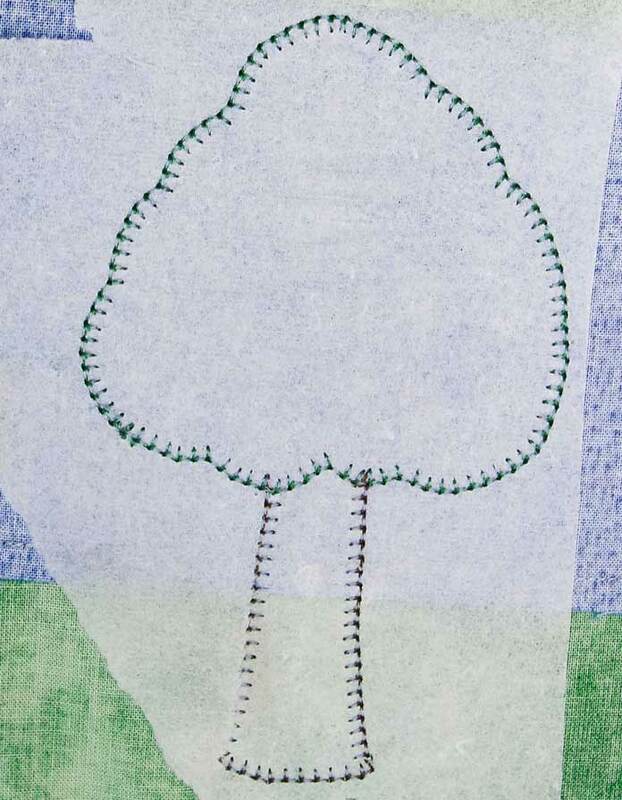 If you move the stitch to the left so the red mark is on the rightmost side of the stitch, you can use the red mark as a guide for the edge of your applique shape. Now that’s brilliant. Applique is beautiful, but if the stitching isn’t done well, it can throw the entire look of the project off. Hopefully the few extra tips I threw in will help you to achieve perfection with your applique. Of course, having an awesome sewing machine like the Husqvarna Viking Epic 980Q helps to achieve an amazing look. 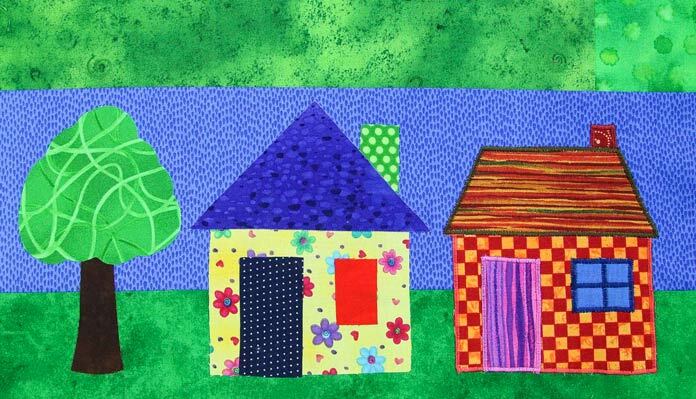 Tomorrow, we’re going to look at some of the advantages in the quilting process. Be sure to come back for that. I love to do applique. I don’t have a fancy sewing machine like you use. 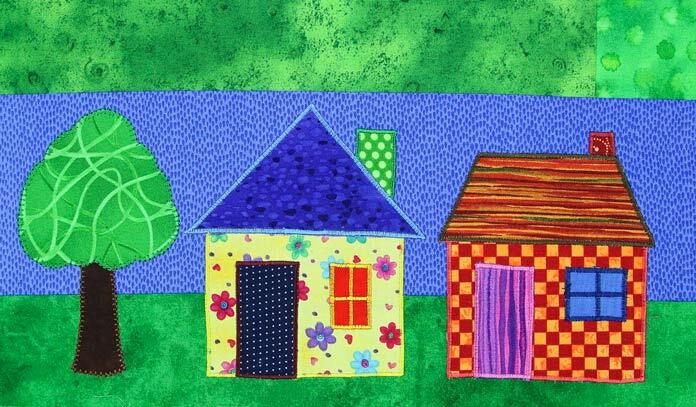 My applique designs are sewn with a fairly close zig zag stitch. I don’t like the look of a satin stitch on an applique design. Another thing that I do is pull the beginning and ending threads to the backside and double knot them by hand because I also do not like the look of backstitching on the applique. Over the years I have found some little tricks that make my applique look nice. Thanks for the tips. Some I knew, some were new.